Their earlier meetings and discussions accomplished nothing toward achieving peace in Syria and Ukraine, nor improved bilateral relations. Washington consistently undermines Russia’s good faith efforts. During Obama’s oval office meeting with Trump, he urged his successor to “stand up” to Russia. The president-elect pledged more cooperative bilateral relations on combating terrorism. It remains to be seen if he’s a man of his word – or just another deceitful politician, saying one thing, doing another. 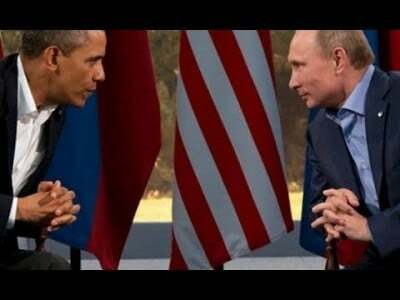 Putin is delighted to see Obama go, adversarial throughout his tenure. So-called 2009 reset with Hillary as secretary of state was farcical, achieving nothing positive. Moscow hopes relations will improve under Trump, Putin taking no chances, hoping for the best, preparing for continued hostility if things turn out this way – his only choice given Washington’s longstanding regime change objective, wanting Russia transformed into another US vassal state. Proving his sincerity requires straightaway rescinding illegal sanctions – no equivocating, just do it by executive order. Failure will raise doubts about Trump’s alleged good intentions. Both leaders plan to meet face-to-face – nothing scheduled so far. Unsurprisingly, Putin acknowledged troubling relations with Obama. “(I)t was difficult to work with each other,” he said. While in Lima, Putin met with other APEC leaders on the sidelines. Most important were talks with China’s Xi Jinping, Russia’s main strategic ally. “(W)e always have things to talk about,” said Putin. Both leaders will meet again in each other’s capitals next year. Their alliance plays a crucial role in working for global stability – unattainable under the Clintons, Bush/Cheney and Obama. Trump has a chance to change things if willing to try. It’s hard being optimistic given America’s imperial agenda. It’s unknown what he’ll do until he begins governing. At the onset of new US administrations, hope springs eternal, orchestrated anti-Trump protests and continued scoundrel media hostility notwithstanding. Nearly two-and-a-half months will elapse from Trump’s triumph to when he’s inaugurated – so-called transition to form a new administration, fill numerous positions, and likely hit the ground running. We’ll then learn if he represents disturbing continuity or a new direction. Will he change America’s role in NATO while keeping the alliance intact? Will he use it to combat terrorism, not sovereign independent nations? Will he stop supporting ISIS, al-Qaeda, al-Nusra (al-Qaeda in Syria) and other US-created terrorist groups, used to further its imperial agenda? Will he pursue improved bilateral relations with Russia and China, or invent reasons not to, blaming Putin and Xi instead of himself? Will he kill anti-consumer, anti-environment, jobs-destroying TPP and TTIP, along with renegotiating NAFTA – or ending it altogether? Inevitably, politicians renege on campaign promises. Pledges most often are hollow. Ignore them. Follow Trump’s post-inauguration actions. Domestic and geopolitical policies he pursues will be the measure of his presidency – for good or ill.